Your humerus is the bone in your upper arm. The surgical neck is near the top of this bone. A break, or fracture, in the surgical neck of the humerus is quite common, especially among older women. We treat this injury by putting your arm in a sling, or shoulder immobiliser, which keeps it at a right angle. This immobilises the bone or keeps it still. You should wear the sling under your clothes for one to two weeks as this acts like a splint and helps to keep your arm still. As your shoulder becomes less painful, wear the sling on the outside of your clothes. At first, it might be more comfortable to sleep sitting up, as this helps to keep the broken bone lined up correctly and stops you from rolling on it. When you have your first check-up two weeks after your injury, you might get a collar and cuff to replace the sling. 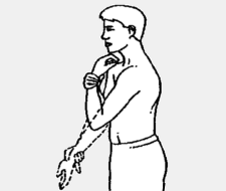 It's important to exercise your wrist and elbow out of the sling at least twice a day. This stops them getting stiff. At your check-up, doctors might recommend you also have physiotherapy. You'll probably have quite a lot of bruising, all the way down to your hand. This is from bleeding from the broken bone and is normal. Make sure you remove your rings before your fingers start to swell. The best pain relief is paracetamol (Panadol) or paracetamol with codeine (Panadeine). Take two tablets every four hours, but no more than eight tablets a day. Don't take anti-inflammatory medication like ibuprofen (Nurofen) or diclofenac (Voltaren). If you need it, your doctor can arrange home help and district nursing assistance. ACC should cover this. If you have any questions, ask your physiotherapist, doctor or orthopaedic nurse. 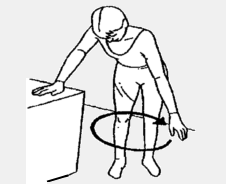 These exercises are a guide for the first phase of your rehabilitation. They might be a bit uncomfortable but shouldn't be painful. Your physiotherapist might give you other exercises to do as well. Aim to do each exercise 10 times. Clench and release your fist 10 times an hour to reduce the swelling. Take your arm out of the sling. Slowly bend and straighten your elbow as much as possible. Do this four to five times a day. Stand beside a table, bench, or something similar, and lean on your unaffected arm, bending forward slightly at the hips. Let your affected arm hang down, with your elbow straight. Swing your arm gently forward and backwards (like a clock's pendulum). Swing your arm in circles, like stirring a pot. Do this in both directions. Written by Orthopaedic Outpatients and Physiotherapy Departments, Christchurch Hospital. Adapted by HealthInfo clinical advisers. Last reviewed April 2018.